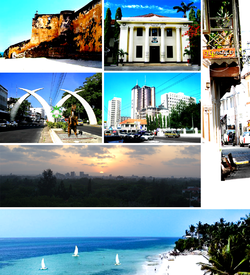 Clockwise: Fort Jesus, Mombasa Toun Haw, Mombasa Auld Toun, Nyali beach, Mombasa Sunset Panorama, Moi Avenue (Mombasa) shawin the elephant tusks in the Avenue an Downtown Mombasa. ↑ 1.0 1.1 Business Daily. Investors fault Mombasa’s new master plan Retrieved on 19th August 2014. ↑ The World Factbook. Cia.gov. Retrieved on 2013-08-17.